Home Health Care Naples: Should My Elderly Parent Have a Pet? Quality Care with Competitive Pricing! Should My Elderly Parent Have a Pet? When your parent begins to need more help to live their day-to-day life, you probably have a lot of questions about adjustments that they need to make to their lifestyle. You want to do what is in their best interest. There are some decisions that will be simple: for example, hiring a home health care aide to come visit them on a regular basis to ensure they remain healthy and happy. Other decisions, however, will take more thought. For example, should your elderly parent who is declining in health care for a pet? Whether your parent already owns a beloved pet or would like to adopt one, there are actually many ways seniors stand to benefit from pet ownership. You may think that a pet is a burden for your senior parent. However, on the contrary, seniors actually do a lot better when they have a furry friend. People with pets are healthier than those without animals in their life. For example, the Center of Disease Control (CDC) reports that people with pets have lower blood pressure, cholesterol levels, and triglyceride levels. In one National Institute of Health study of people who had had heart attacks, one year after the cardiac event, dog owners were more likely to still be alive than their pet-less counterparts, regardless of how severe the attack was. 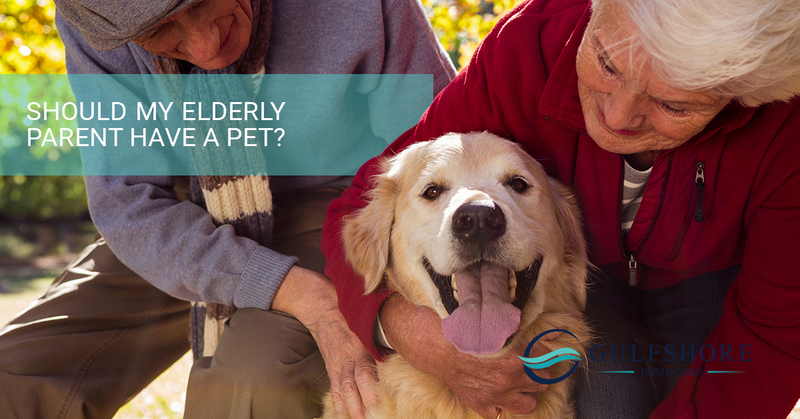 A pet may be just what the doctor ordered for your senior parent. Not only does your senior parent stand to benefit physically, pets are excellent for mental health. First, if your parent is experiencing a cognitive decline, you may worry about leaving them with a pet, but this could be exactly what they need. Because pets communicate non-verbally, spending time with animals provide seniors with loving companionship that doesn’t require them to try to keep up with a conversation. Given how prevalent loneliness is among the senior population, a pet may be exactly what your parent needs for company. In fact, holding or petting an animal has been shown to be therapeutic to people of all ages. In addition, pets give seniors structure to their day. Because their pet needs to be fed or walked on a particular schedule, pets naturally give seniors a routine, which helps protects against depression. In summary, pets are a great choice for seniors. In fact, if your senior parent already owns a pet, you should not take this pet away from them. The grief from the separation is extremely detrimental to them. If your parent doesn’t have a pet but would like one, there are many ways that they stand to benefit from the company of a furry friend. If you are concerned about your senior parent’s ability to stay at home where they can have a pet, then home health care may be exactly what they need. With an in-home health aide, your senior parent can stay in the comfort of their own home with a beloved pet. If you need home health care in Naples, contact us today to learn more. Our Certified Nursing Assistants and Home Health Aides are the best in the area. Call us today for a free consultation so we can develop a plan for your needs. We have skilled nurses, whether you need 1 hour to 24 hour home health care; we will match you with a Highly Qualified caregiver to provide services for your needs. If you are looking for a companion to provide company, we will ensure that you are satisfied by providing you with hand picked caregivers to meet your needs.